Amongst the several similarities between C.S. Lewis' Narnia and the actual Umbrian Narni we can find a castle, overlooking the valley from the top of the hill: the imposing Albornoz Fortress (dating back to 14th century). The actual Narni has its own Aslan as well: a Roman statue depicting a lion, whose gentle features are anything but wild. Today this statue is kept inside the courtyard leading into the town hall (the building dates back to 13th century), and it seems to watch over justice and social life in the town, just like the Great Aslan used to do in its Narnia. A pre-Roman sacrificial altar lies along the Flaminia road, just a few Kilometres away from the city centre, by the cave called Grotta d'Orlando: it is very similar to the Stone Table where Aslan dies and then resurrects. The lake with silver waters described by Lewis incredibly reflects a place by the small village called "Le Mole" along the road connecting Narni with Orte and Nera Montoro, maybe the same place where the Villa described by Plinius the Younger used to be in Roman times. Here the small river turns to be deep blue because of the great quantity of magnesium in the water. Probably this is the same water praised by Plinius in his letters, and later on it was admired by other special tourists coming to Southern Umbria from England, Germany, France, on their way to Rome during the Grand Tour. A lot of aristocrats, artists and writers used to set out on a long journey during the 17th, the 18th and 19th centuries, in order to discover Italy and the classical world and beauties. Narni and the area of Terni were important stop on the way to the Capital city, because of the Flaminia road, which connected Rome with the northern part of Italy. The Marmore Waterfalls by Terni, "horribly beautiful", have been well described in a famous poem by George Byron; the blue waters by Narni looked even more impressive under the famousAugustus' Bridge (27 AD), so similar to the bridge crossed by the Pevensie brothers. The impressive ruins of this Roman work lie between rocks and trees, while the river Nera flows through the valley, creating a magical atmosphere: the same charm famous artists were struck by, and the main reason why they depicted it. 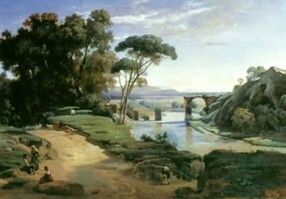 The most famous paintings representing the Augustus' Bridge are a work by the French artist Jean-Baptiste Camille Corot (1796-1875), and they are today exhibited in Paris and in Canada. The gryphon is a winged animal (originally coming from the far east) with an eagle head and a lion body; it is a further similarity between the fantasy Narnia and the Umbrian town. The gryphon has actually been the heraldic symbol of Narni since the Middle Ages, the eagle representing the city power, and the lion its courage and watchfulness. A strong animal which fights side by side with Aslan, defending the good, against the White Witch (the evil. Is it just another fortuitousness between the different Lands of Narnia? Maybe, we just have to follow Lewis' book, The Lion, Witch and Wardrobe, where in the last page he writes: "This is the end of the adventure inside the wardrobe. But, if the professor was right, it was just the beginning of the adventures to Narnia". Yes, maybe all we have to do is to get into these fantasy wardrobes, as Lewis did.